Many enterprise applications need users to enter URL, port, email address, and other similar configurations as a one-time setup of an application. An app configuration is an easy way to configure a large number of devices with custom settings such as email, network, and so on. MobiLock now allows you to customize the configuration settings of your iOS apps. Not all applications accept App Configurations. It is upto the application developer to be able to read configurations that are pushed from an MDM provider. Please contact your app-developer to check if the app supports configurations. ✅ You must have a MobiLock Dashboard account. ✅ You have created an iOS Device Profile, enrolled a iOS Device. ✅ You have published an application from Apple App Store or Enterprise Store that accepts App Configurations. From your dashboard, go to Enterprise ➞ My Apps. Select an iOS application (from Apple App Store or Enterprise Store) that you have previously published/installed and click on View Details navigation button of the app that you want to configure. Select the App Configurations tab and click on the Create button. Create App Configuration window will appear. Enter a name for this configuration. 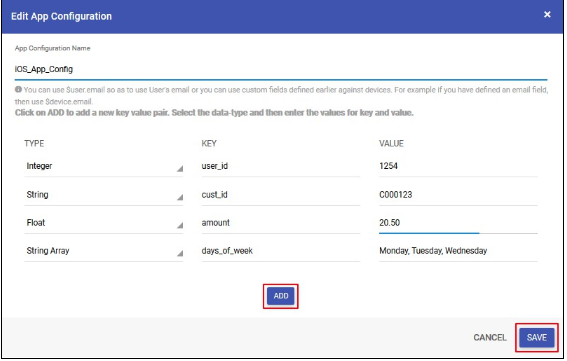 Data Type: Choose a data type for your configuration from the dropdown under the Type field. Key field: Enter the name of the configuration under the Key field. Value field: Enter the value for the configuration under the Value field. The following table explains the data-types available to for app configuration. Allows you to define a key as alphanumeric characters. 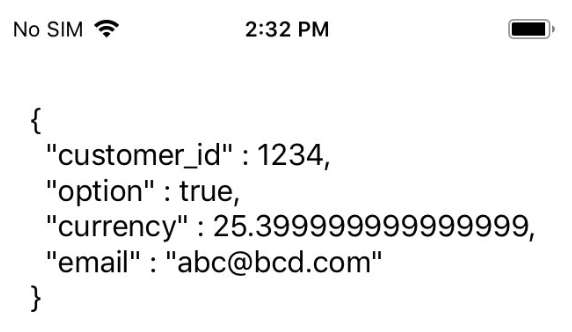 For example: email id, user_name. Allows you to define a key as an array of strings. For example: Usernames, Model names. Allows you to define a key as a logical expression that has True and False as values. Allows you to add a key as whole numbers. Allows you to add an array of integers as a key value. Allows you to add decimal numbers as the key value. For example: amount, currency, measurement. Allows you to add an array of decimal numbers as the key value. Once you have added all the keys and values, Click on the Save to save the configuration. The image below illustrates a sample configuration. 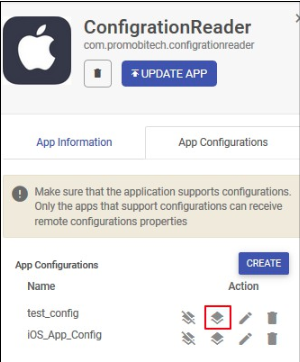 Publish: Use this option to publish the configuration to the iOS Device Profiles. Edit: Edit a configuration using this option. Any changes to the published configuration will automatically be pushed to the devices. Delete: Delete the configuration. This will remove the configuration from existing devices and stop publishing it for future devices. 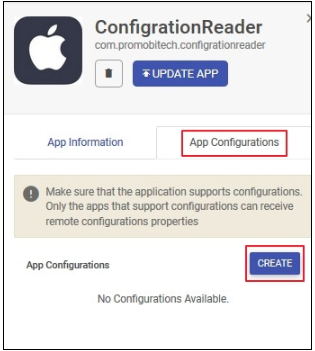 Select an iOS application from Apple App Store tab or Enterprise Store tab, where you have created a configuration as described in the earlier section. Navigate to View Details > App Configurations. Select the Device Profiles and click PUBLISH. The configuration will be published to the devices and depending upon the application it will use the configuration. In the illustration below, we have used our in-house app to print the values received via configuration.